We had a very good time at Chaltunha. The owner is very nice and interested and helps with all the questions you have. He even takes you down to the lake in the middle of the night if you have a trip booked to e.g. Tikal. 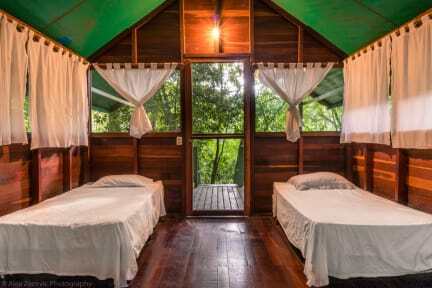 Regarding the property: We had a private hut, which suited 3 people and had its own bathroom. The hut is big and clean and the property its on is very nice and peaceful. The view from the restaurant/bar is awesome :) Defitinely good place to stay! Great hostel with a perfect view, breathtaking. The owner helps with everything so more then worth it to stay! Rooms are clean and gives a goos athmosphere! Loved my stay here. The owner Neil helped us out with everything! Getting to flores, getting to the rope swing, picking us up once arrived. Dorms were nice and the view is amazing. Nice vibe!! It's a little further but like I said Neil takes care of everything. There is no kitchen so you have to order food at the restaurant or back flores (5 each way). Really enjoyed staying here and Neil thanks for everything! This a very nice spot if you're staying in flores for a few days. It's not actually on the island so you have to take a boat every time you want to do something but it's well worth it. The view is amazing, the swimming pool is nice and the cabins with 360 degrees gardin view are superb.